Home decorative ideas with Owl cannot go wrong, as you have a lot of choices from sculptures to rugs. You can even theme one of your room with owl and make it spooky which will be thrilling at night with an added owl decorative night lamp. Owl Sculpture – Murano Style Flying Owl sculpture is eye catchy with its yellow and black combination. Pair of colorful little owl will be perfect for kids room. Owl Decorative Pillow Cover – Have a soft and adorable owl pillow cover made just for you! Choose from an owl shaped or square shaped pillow cover in your choice of color and pattern. Owl Wall Clock – Decorate your home with these Owl shaped wall clock be it with a metal design or a big owl which cover your entire wall. Owl Wall Art – From wise old owls to baby owls, this collection of adorable owl art will delight kids and babies alike. Grab one of your favorite and lavish your walls. Owl Wall Décor – A long branch with colorful leaves is the perfect perch for this cute family of Owls. Have a hoot decorating with the Owl Wall decor! Owl for Decorative Dining – Come out of the box with some unique owl dinning sets. Variety of Owl dinning set ranges from cute little salt pepper spray to beautiful owl shape tray and tea set. Owl Themed Bedroom – This owl bedroom theme is absolutely perfect for your bedroom accessories. Owl pattern itself is really cute with light and fresh colors. Owl Lamps – Add a funky accent to any room in your house with a unique owl lamp and have it watch over your household from the side table, to see how it sparkle. Its shade evenly distributes light, creating a soothing ambience in the room. Owl Racks – Why having the same racks always with geometrical shapes. Let’s have some change with this owl shape racks and get a different look and feel to your drawing room. Owl Candle Holder – Feather-like openings on these owl candle holders allow glimmering light to flicker through, creating an interplay of light and shadow. Owl Flower Vase – These pair of small owl vase with blue ink glaze are perfect for little flowers and buds. They are made from stoneware. a very durable chip resistant clay body. Owl Wall Hanging with Hook – Spooky Owls are attached to the back of easy hanging. 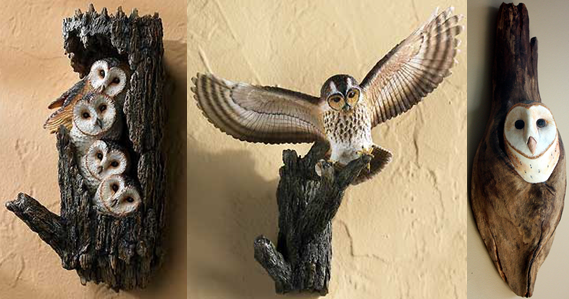 These wall hooks are so perfect as it fulfills your owl theme too along with hanging clothes. Decorate your home with these Owl home décor collections. If you are going for an owl theme, then this not the limit for owl deco items, there are much more. Also If you have a very unique owl item at your home, please take a click and send it to us so that we can include it here.